Many thanks to feline follower Poms for sending this intriguing postcard from the village of Spondon, just outside Derby in the East Midlands. This is the purrfect example of Geography Cat’s Project Postcard rationale; that is to say that sometimes people can overlook the beauty and culture of what they regard as an ordinary place. A place that appears ordinary to one person may be fascinating to another. 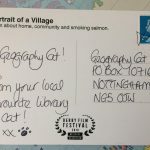 And if this understated postcard doesn’t convince you then Geography Cat recommends you take a look at the documentary film Portrait of a Village, by local filmmaker Mark Rivers, awarded Best Film at the 2015 Derby Film Festival for Masterpiece. Find out more by clicking just here.